Vikings : discover the incredible online video slot from Netent ! Vikings ™ : if you like the TV series, you will love the online video slot from Netent ! Based off the popular historical and drama tv-series ‘Vikings’, this NetEnt powered slot is full of excitement and suspense. Follow the exploits of the grand ruler Ragnar Lothbrok and his crew composed of Floki, Bjorn and Lagertha which star in this Irish and Canadian co-production in their conquest of Old England and Francia. This online video slot further outlines the know-how of the slot provider for the detailed graphics it features are truly incredible. Packed with Special Features, Vikings ™ brings excitement back on the reels. This video slot is ideal for all players with a soft spot for Norse-themed slot games, however it will especially please fans of the series for they will come face to face with their favourite characters on the reels. Get ready for a trip back in time with this slot game which captures the adventures of barbaric Norse invaders straight out of the 9th century. The classic and widely appreciated theme of this branded video slot paired with the high quality of the design and animations make for an unforgettable gaming experience with a max win of £1,000,000 on max stake and a fabulous Return to Player of 96.05% ! Vikings™ is a 5 reel, 3 row online slot machine without any bet lines. Instead, it offers 243 fixed ways to win, which means every possible winning combination of at least 3 symbols from left to right across the reels will score you some winnings. It is playable with a bet starting from 30p up to £100. The reels are set in the middle of a dark field, an imposing pole with a skull and a Viking flag sitting on the left hand side of the reels. On the right hand side, one can distinguish a fence with a shield resting against it and a crow looking into the distance. As regards the backdrop, it depicts a range of mountains which are barely discernible for they stand in the midst of a snowstorm. The lower paying symbol include the classic 10, J, Q, K, A sporting a metallic design smothered in blood in order to make them fit the atmosphere of this slot game. 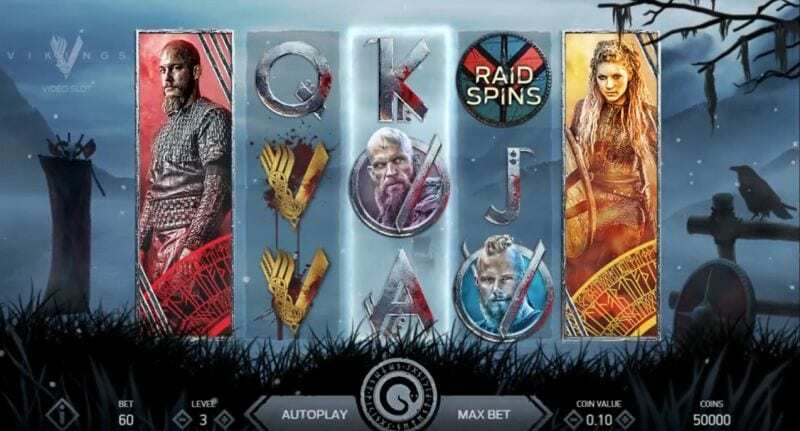 On the other hand, the higher value symbols represent the main characters of the series which all offer gamblers 28 coins for every 7 symbols representing either Ragnar, Floki, Bjorn or Lagertha, our fearless warriors. Alongside them, the Vikings ™ logo, a golden V, which according to the paytable may enable gamblers to achieve the highest potential winning combination. 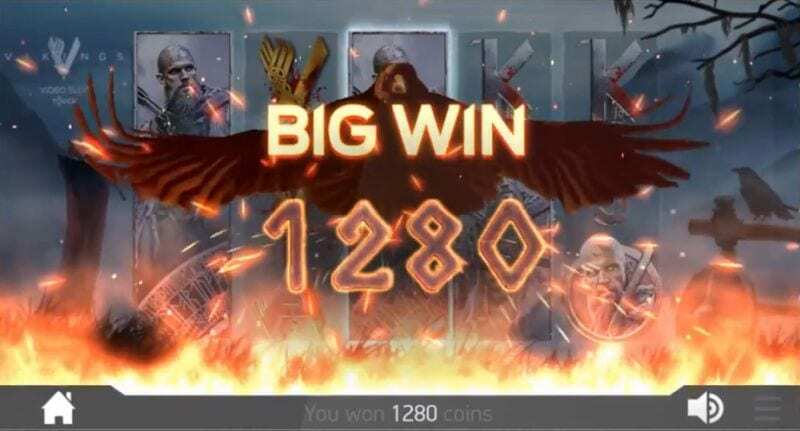 As a matter of fact, for every 7 of those symbols featuring in a winning combo, one may receive a big win of 70 coins! NetEnt has adorned this Norse-themed slot machine with an array of Special Features which are undoubtedly the most exciting aspect of Vikings™. Amongst those Bonus Features, one may come across the Hotspot Feature. In the main game, it is triggered when a fully stacked Viking symbol lands on reel 3, which is constantly highlighted by a flow of warm light. When this occurs, all other Viking symbols present on the reels will turn into the symbol representing the warrior which activated the feature in first place. In addition, this feature pays Scatter style which means it offers a chance at making some mega wins, for you can land up to 27 of the same symbol which would reward you with 200,000 coins! The Raid Spins Feature may be unlocked by landing 3 of the Raid Spins symbol which depicts a shield reading ‘Raid Spins’ on reels 3, 4 and 5. This thrilling Feature will not only award gamblers 7 Free Spins but will transform the 5×3 reel format into a 7×5 setup with 78,125 ways to win instead of just 243. On top of that, the Hotspot reel now covers 3 reels rather than just reel 3. The change in backdrop during the Raid Spin is truly awe-inspiring as it changes into a scenery of war, fire and destruction. Lastly, we find the Shieldwall Feature. This randomly triggered Feature involves a cluster of shield mystery symbols in the size of 3×2 or 5×2 appearing on to the reels which will transform at random all the symbols lying underneath it into one of the symbols featured in this online slot machine. Wins will then be evaluated. With its crisp graphics and superb animations, Vikings video slot is a captivating slot full of potential which will transport players into the universe of the iconic historical series it is based off. It is sure to please all those with a taste for Norse mythology yet also those who enjoy stunningly designed slots packed with exciting Special Features. Playable from 30p to £100 per spin, the HTML5 format of this NetEnt powered video slot makes it available not only on desktop yet also on tablet and mobile. The epic and immersive soundtrack it features paired with a hit frequency of 18.0498%, an RTP of 96.05% and high volatility and promise an incredibly thrilling gameplay. Join your favourite characters straight out of the dark ages in Scandinavia as they attempt to invade France and England for a chance at winning £1,000,000.